The diamond went up for auction in 2016, but it didn't sell. A diamond the size of a tennis ball just sold for $53 million. The Lesedi La Rona weighs in at over 1,100 carats. It's the second-largest gem-quality rough diamond ever discovered. But the buyer, Graff Diamonds, got it for a bit of a steal. 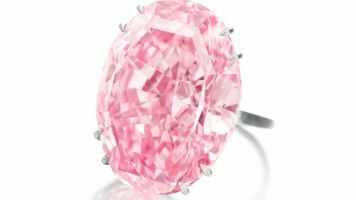 That's because the stone was expected to go for more than $70 million when Sotheby's tried to sell it in 2016. But no one bought it. The only gem-quality rough diamond ever found that was larger was the Cullinan diamond, which weighed more than 3,000 carats before it was cut into smaller stones. Those were then built into some pieces that are part of the U.K.'s crown jewels. Graff Diamonds says it will also cut the Lesedi La Rona into smaller stones.